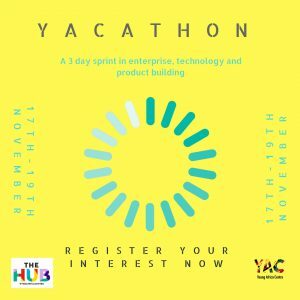 Young Africa Centre Hackathon - YACATHON | The Africa Centre | Proud of our past. Passionate about our future. 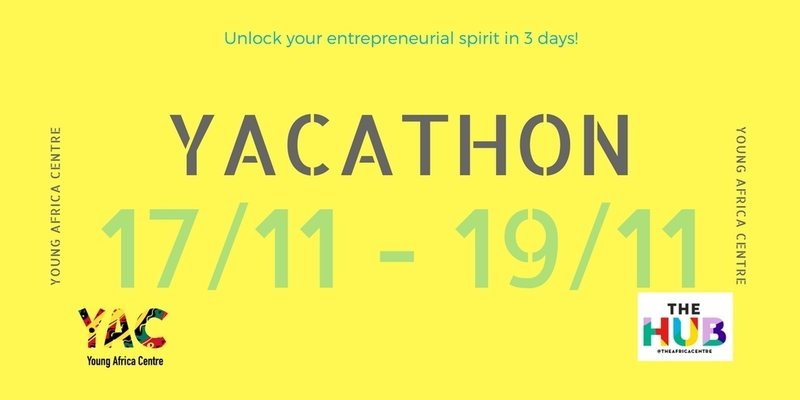 We would like to invite you to our Hackathon event happening this Global entrepreneurship on the 17th-19th November. We want to help address the lack of Black people in tech in general. There is currently a lack of data focused on the inclusion of Black and minority ethnic groups in the tech ecosystem. Tech is a great enabler of this demographic to be at the centre of creating their own opportunities and feed into a system that is unknowingly starving itself of innovative ideas. There is a new generation of young people that are interested in technology and are increasingly interested in entrepreneurship. 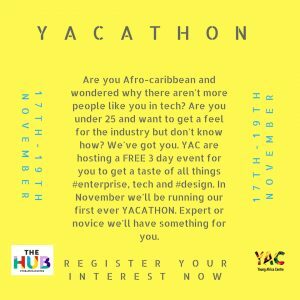 YAC want to support this new movement as a more diverse tech ecosystem results in more creative and meaningful tech solutions to problems that affect the world around us. As the UK economy moves towards being tech focused, it’s important that nobody is left behind! For tickets please follow this link!